Posted by Austen Edwards in Travel Log. As our time in France wraps up, I have to admit that I’ve really enjoyed Paris. The amount of art, the number of museums, and the weight of history in the city can quickly become overwhelming but I think we put a nice dent in the endless sightseeing agenda that is Paris. Obviously, you can never really see everything but we were at least able to the hit all of the major must-sees. 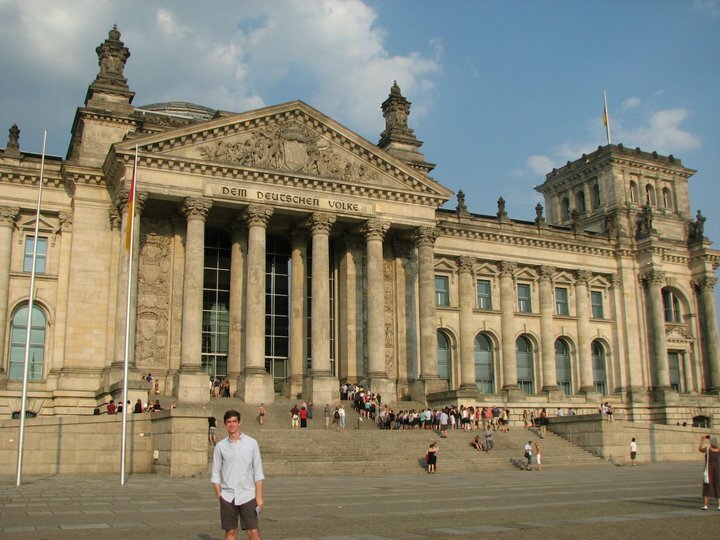 However, my favorite part was not some museum or even visiting so many historic sights. Instead, the chance to wander aimlessly through the Latin Quarter or explore the city during the madness of Fete de la Musique was, in my humble but totally accurate opinion, an amazing opportunity to just get a sense of the city. After all, is there any city better suited for strolling than Paris? On the other hand, I’m also really excited to be heading to Germany, especially considering the excitement of the World Cup! Over the last ten years or so, I’ve heard about the rare but powerful national pride with which Germans support their players. Because of the national shame coming out of the World Wars and the rebellion against ‘what their parents allowed to happen,’ many Germans are at best antsy around so many flags but there has been a surge of nationalism built on the success of their football team. I’ll be interested to see how this plays out over the next few weeks and how it plays into modern attempts to rectify the past with everyday East-West dynamics. Are the Germans willing to take on a strong-enough role on the world stage to be dominant power of the EU’s eastern bloc? Or do they feel the historical need to capitulate to the demands of Western Europe and the US? My gut feeling and evidence from the EU’s bail-out plan for Greece demonstrate the former but I’m not sure if that would have been true 15 or 20 years ago. Because Germany still serves as the borderlands between the longtime trailblazers of European integration and the new ‘Eastern frontier’ of the EU, I think there’s a lot to be gained from understanding the domestic struggle over identity and ‘being German’ in an EU context. If nothing else, I’m just excited to be going to a country where I at least semi-understand the people, the food, and the language! Well, today is our last day in Brussels until a few of us return for our internships in three weeks. All in all, I have to say that the city has really grown on me. For a tourist, it doesn’t have that the same immediate charm that you find in some other small cities across Europe or the fascinating hum of other global capitals. It is very much a government town, in every sense of the phrase. However, the longer you spend wandering aimlessly through the cramped streets, the more you appreciate its subtle qualities: the scent of waffles that wafts down every street; the sudden and often unexpected changes as you walk by the EU institutions, through a neighborhood of near poverty, and directly into one of Horta’s Art Nouveau masterpieces; the cartoon murals that provide a nugget of quirky Belgian humor on a misty afternoon. No, Brussels, at least in terms beyond governmental institutions, is not a world-renowned metropolis like Paris and London but I’m perfectly content to enjoy its own flair. 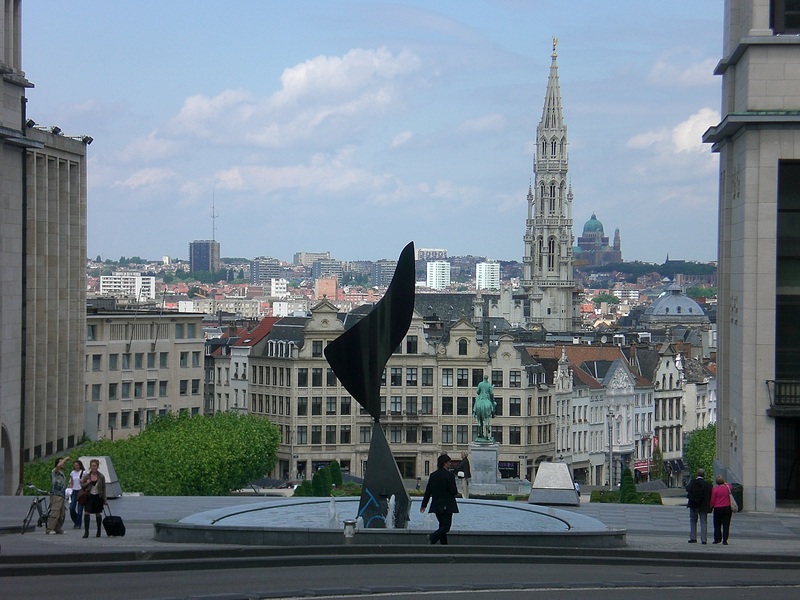 Especially as a study abroad student, it’s easy to see Brussels’ incredible sights in a matter of days before quickly taking off your Chacos and aviators to throw yourself into being Belgian. I can’t imagine spending three weeks trying to get a real sense of what Paris is, how its heart beats; to me, it’s simply too big to feel like I am a part of the city. When I recognize people on the streets of Brussels, it seems as if our time here has opened the door to Belgium for us and invited us in to be a small part of it all. It really has been an amazing three weeks. 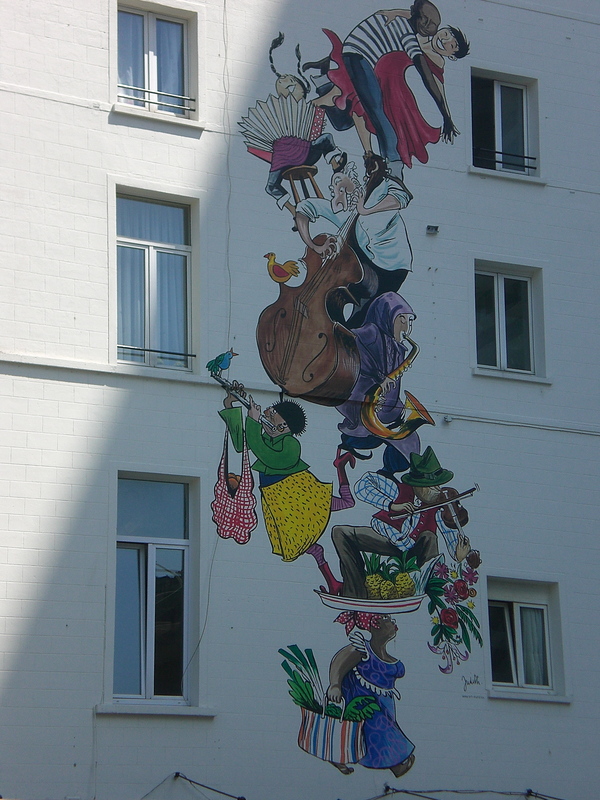 At the moment, I’m sitting on a train from Paris to Normandy and I wanted to take the chance to write about my impressions of European diplomatic culture, the French in particular. Over the last few weeks, our merry band of travelers have been going to dozens of site visits and scores of briefings at every international institution, think-tank, and house of government in greater Western Europe area. We spoken to diplomats and parliamentarians, interns and eggheads, all of whom have usually been really interesting to talk to. Yet, somehow, during our separate site visits to NATO and IFRI (a Parisian think-tank), I came to the sudden realization that I was becoming increasingly annoyed by each Frenchman that spoke to us. Although they were generally very welcoming and hospitable, I could only get a sense of haughtiness and obnoxiousness. Now, I fully recognize that some of this perception stemmed from my own bias against Frenchmen (and for Germans instead) and some slight American hubris. But, even controlling for these variables (to use my limited Techie vocab), I couldn’t help but be irritated by some element of what they were saying. After some self-reflection and counseling from another (Francophile) student on our program, I was able to grasp a better understanding of the diplomatic culture in France and its similarities/differences to that of the US. In many ways, both countries come to the table with the same attitude: a firm belief in our own ideological and historical exceptionalism and our near-divine duty to lead the globe while fiercely defending our hard-won independence. What is interesting, however, is the way in which we’ve chosen to translate this attitude into actual action on the world stage. For better or worse, Americans seem to be highly optimistic about our role of spurring the globe to reform the world stage incrementally. We, the Americans, seem to recognize that each period in which the international system was completely overhauled it was accompanied by insecurity and instability. However, we are too optimistic or idealistic to give up on making it a safer world, one agonizing step at a time. The French, by contrast, seem to have gained a more pessimistic, disillusioned, or dismissive attitude towards the post-modern world stage – a product, no doubt, from their admittedly turbulent history over the last 150 years and the repeated disappointments of the international system they’ve experienced. When combined with their sense of inherit French exceptionalism, they appear to many Americans (often inaccurately) to have a self-centered, entrenched approach to international cooperation, where they simply dig in their heels on one minute detail or another to hold up the entire process. While it is undeniable that the French have a focus on defending “me and mine” above all else, I think it is more accurate to say that they hope for revolutionary (if reactionary) changes to the world stage and remain highly skeptical of the step-by-step reforms the Western (American-led) diplomacy yields. So, while I can see important cultural (or more likely political-cultural) similarities between our two countries, I can easily see how diplomats on both sides can leave the negotiation table with frustration and bitterness towards each other. I can’t say that it explains all of the difficulties in Franco-American relations but this discovery certainly helps to clarify my personal frustrations with French diplomats. Time for another update! The ‘London crowd’ arrived in Brussels two days ago without much fanfare other than an overpriced, rescheduled train ticket and one hotel concierge’s love note to the girls about where to find good Belgian beer and chocolate. The next day, Mike and I moved in with our host family, the Willemyns. Pierre and Mariann are a nice couple who appear to be in their late 50s or early 60s, enjoying retirement but still very active. They have 5 children (ages 24-34) who are all very successful and scattered over the larger Benelux area. I hope by the end of my stay to remember all of their names, professions, and children… but I can’t make any promises. 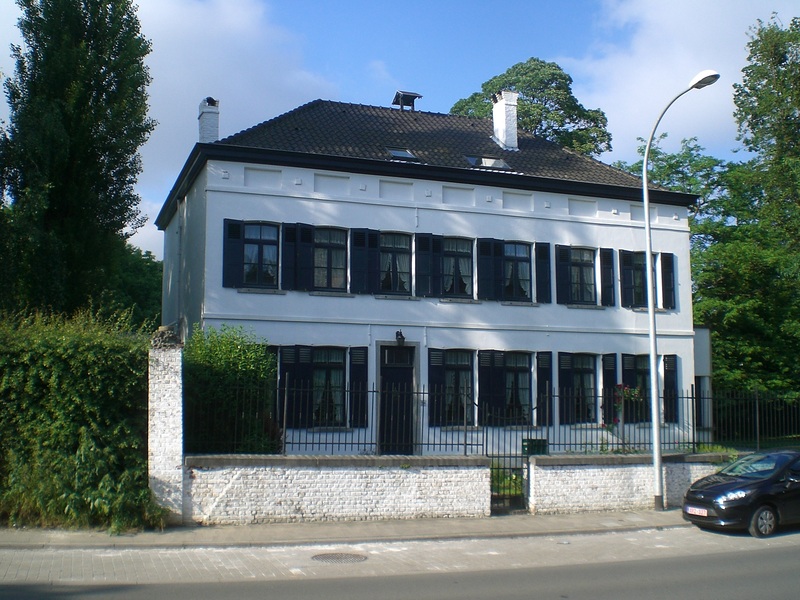 The Willemyns’ home, Le Petit Chateau, is a 140 year old, classic Belgian farmhouse that is part fixer-upper, part historic artifact, and part family home; whatever it is, there’s no doubt that this house is the center-of-life for the entire extended family. It has been in the Willemyn clan for generations and, as Mariann describes it, they were lucky enough to be chosen among Pierre’s 21 cousins to inherit the family jewel. This is where his mother was married, where he was married, and where his eldest daughter will be married in September. In fact, they will be hosting a huge celebration and reunion in a few weeks just to mark the 75 years since the family first moved in. Although it has since been surrounded by modern homes and duplexes, its large gardens, original shutters, and perpetually broken lock speak to the burden of family tradition and memories it carries. Pierre and Mariann are just as inviting as their home with warm smiles, youthful flexibility, and gentle parenting. He has a degree in geology and she has one in physics; their familiar nerdiness is a comfort for a guy who grew up in a family of academics. In their earlier years, they lived in Burkina Faso and Nigeria as Pierre worked with the UNDP, before returning to Kraainem (their Brussels suburb) to raise a family. 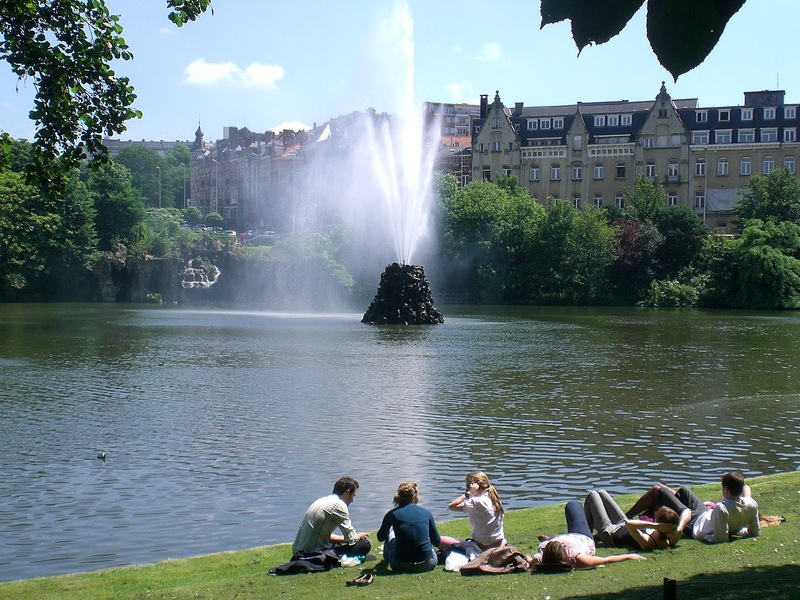 Over the years, they have hosted many international students and think nothing of the time they take to explain Belgian ways of life. In many ways, they are much like any American couple with only occasional quirks that remind us that they are distinctly Belgian and French-Belgian at that. Although that they are always welcoming and accommodating, it has been somewhat stressful to interact with the Willemyns. Belgians are, almost by nature, a quiet, reserved, and shy people. As Mariann says in broken English, “The Belgians are not very friendly.” I can only assume that she means they are rather introverted — sort of like how Audrey Hepburn always seems to be whispering in the movies and only reluctantly seeks new adventures. Well, for an outgoing American student with little patience for such mouse-like behaviors, this quietness only adds to the anxiety of building a relationship with a host family despite a language barrier. However, we are slowly working through the welcomed challenge as we learn each other’s habits, help them practice for their English exam on Thursday, and come to understand the cultural personality we each bring to the small dining room table. I hope we will learn more about this wonderfully typical Belgian family over the net few days. But, for now, I’m happy to say that I have fallen in love with Belgian cuisine! Hello from London! As usual with international flights, it was a hectic process to get here from Atlanta. When we landed, there was the usual chaos of trying to pull your senses together in a new city. After a short ride on the Tube, we ended up in this really cool part of the city near the Imperial College – London and the Royal Albert Hall. Somehow (I’m not entirely sure how) we ended up at this awesome (*clean) hostel housed in an old townhouses in South Kensington, called Astor Hostel – Hyde Park. It has this great vibe of being relaxing, young, and uniquely London… kind of like what I imagine a common room at Cambridge might enjoy. With a couple lounges with wireless internet and flat screens to watch football matches, it seems to have a permanent flow of university students from around the world coming and going. I would definitely recommend it to anyone that’s planning a trip to London. Yet, it didn’t take long to run into a little bad luck… We got into our rooms without any major problems and then went out to eat for supper and explore Hyde Park before heading back to finish up homework and get to bed early.This is when things start to fall apart. I’m sleeping in a top bunk (maybe 5 feet off the ground, max) when, at some point, I decide to go parasailing off the side of the bed to gently fall on my face and split my eye brow open. The other GT students that are traveling with me heard the rather loud thunk and realized what happened — apparently there was “blood everywhere” — before going to get help from the front desk. Long story short, I started to remember things about 10 minutes after falling and pulled myself together enough to call a taxi to take 4 of us to the hospital. The nurse took a look at me within 5 minutes of us arriving, decided I needed stitches, and then told us to wait for the doctor, which we did for 4 more hours. Eventually, the doctor sowed me up with eight stitches in my eyebrow and three in my ear, then gives me medicine, and tells me to go home. ** Thanks to the UK’s amazing socialized medical industry, it was entirely free! … well besides my 5 hours of lost sleep. No, I’m not arguing for socialist medicine in the US but I’m not complaining either. So, we eventually got back to the hostel at 5am and slept for a grand total of 3 hours before heading out for a long day of sightseeing. Thankfully, I realized this morning that if I just wore my aviator sunglasses the entire time, no one could see the now VERY swollen, purple eye and I would no longer scare small children or old women. The swelling is slowly going down thanks to some Advil on loan from another student but I’ll need to go back to the hospital when we get to Brussels to have the stitches removed. 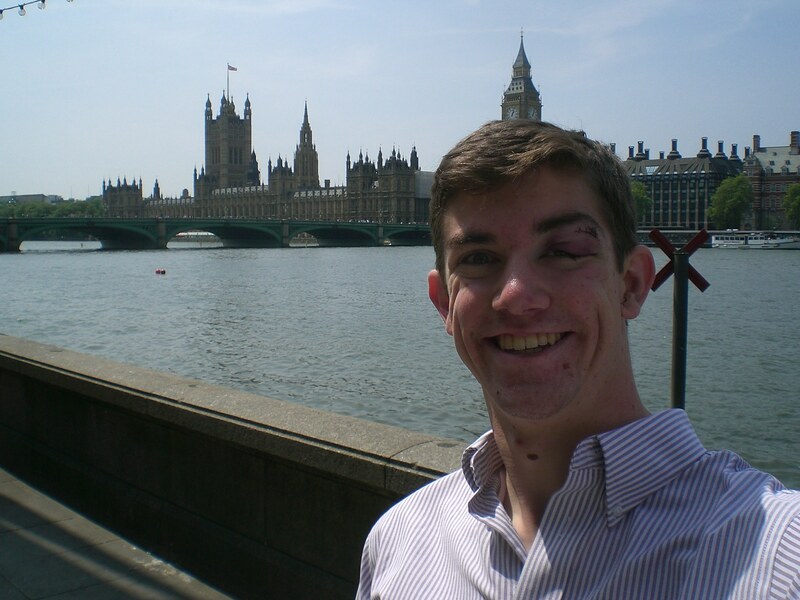 In the meantime, I have some very mean looking photos from across London and I’m still working on a better story for my giant, swollen black eye. I’m currently dreaming up an awesome tale about a heroic brawl in a pub with a swarthy Scottish man named Grimm… but it’s a work in progress. Also, thanks to Crystal, Katelyn, and Mike for taking me to the hospital at 1 am… I owe you.